The nation’s biggest bank by assets turns in a record quarter. The Chase Tower in Dallas, Texas. Image source: Wikimedia Commons. If it wasn't clear before, it certainly is after fourth-quarter earnings: JPMorgan Chase (NYSE:JPM) has emerged as one of the biggest winners in the bank industry over the past decade. The bank reported on Friday that its earnings in the final three months of last year soared by $1.3 billion, or 24%, compared to the year-ago period. "Our results this quarter were a strong end to another record year, reflecting our intense client focus and solid performance across our businesses," noted chairman and CEO Jamie Dimon in prepared remarks. All told, JPMorgan Chase earned $6.3 billion in the fourth quarter. That's an enormous amount of money that puts the New York-based bank in a league of its own. The next two biggest banks in the United States -- Bank of America and Wells Fargo -- don't even come close, each earning less than $5 billion over the same three-month stretch. Data source: Fourth-quarter earnings releases. Chart by author. JPMorgan's results were fueled by a surge in trading revenue, as the bank is one of -- if not the -- largest market maker on Wall Street. The bank had said in December that its trading revenues were trending 15% or so higher compared to the same quarter last year. JPMorgan Chase's actual results came in above this. Its trading revenue increased 24% in the fourth quarter, to a record $4.5 billion. That compared to $3.6 billion in the year-ago period. The results for its fixed-income unit were even better, growing by 31%. The presidential election in November served as the catalyst for the surge. The unexpected outcome required institutional investors to reposition their portfolios in the election's wake. "When clients transact, we're able to capture the flow," said chief financial officer Marianne Lake on a conference call Friday. The $2.5 trillion bank also benefited from higher interest rates, though not as much as it will in the current year. Higher interest rates broadly translate into higher rates on loans, specifically. And higher rates on loans translate into higher revenue and earnings for banks. According to JPMorgan, as of Sept. 30 of last year, a 100-basis-point increase in short- and long-term rates would equate to $3 billion or so in additional net interest income over the 12 months following the rise. If you divide that by four, you get a sense for the impact on a quarterly basis. JPMorgan didn't experience the full benefit from this trend, as rates didn't rise until well into the quarter. 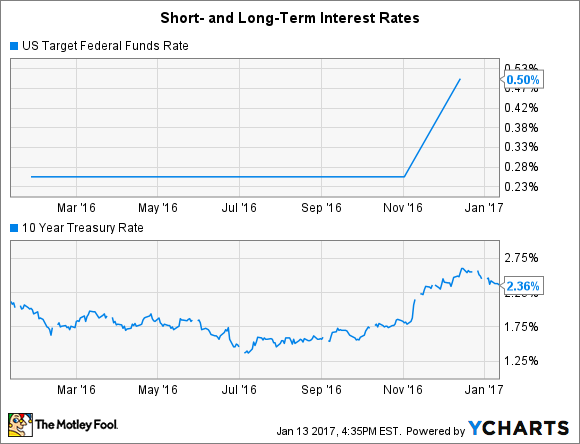 Long-term rates shot up 90 basis points in the wake of the presidential election. Short-term rates followed suit a month later as the Federal Reserve boosted the fed funds rate by 25 basis points at its monetary policy committee meeting in December. U.S. Target Federal Funds Rate data by YCharts. The upward trend in rates nevertheless contributed to a $500 million, or 5%, increase in JPMorgan's net interest income in the fourth quarter. The thing to watch now is the current quarter -- the first quarter of 2017 -- which should benefit from the entirety of the boost, pushing the bank's profits even higher. Finally, JPMorgan's record quarter was also helped by lower expenses and credit costs. The bank's operating costs fell by $430 million, or 3%, compared to the fourth quarter of 2015. Its provision for loan losses shed 31%, or $387 million. All told, it was an extraordinary performance from one of the most venerable names in finance. And better yet, it seems as if things will only get better from here.